Mix the fish, pepper, onions and lettuce together. Season to taste with chilli sauce. Cut the pitta breads in half crosswise and open up to take the filling. 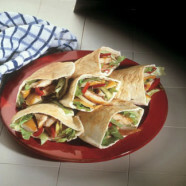 Fill the pitta bread with the fish mixture and serve as a snack or lunch dish.